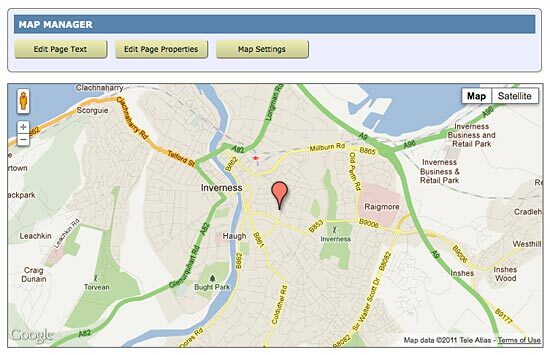 Spanglefish includes a facility for using an 'embedded' Google Map on your site to show your location. This is handy for users who want to know where you are based, and because it provides the zooming and scrolling abilities that they are familiar with. They can also use the map to get driving instructions, which is handy if they want to have a meeting with you. In addition, having a Google map on your site may help your results in Google searches, as Google can match your location with search criteria used by potential uses or customers. The Spanglefish administration system lets you easily edit your location on the map, showing your position with a marker on your site's Map page. If you move locations, then it's a quick and simple process to change the map to reflect this. Spanglefish allows you to edit your location map settings either directly in Sites Settings > General Settings > Site Location Map, or by clicking on the 'Map Settings' control panel button on the map page iself which links directly to the same Site Settings section. The Sites Settings > General Settings > Site Location Map facility lets you configure a range of location map settings . . .
1) Your Country: if not already set correctly during your Spanglefish sign-up, select your country location from this drop-down. Even if you don't want to have the Map page displayed publicly on your site, it's a good idea to use this setting as it can help Google match your location with searches, and thus help your rankings. 2) Set Your Location: click and drag within the map area, zooming in and out as needed, until the cross-hair in the centre of the box is at the correct location. Then zoom in or out until the map shows just the area as you want it displayed on the public map page, and this will set the default zoom level for you. 3) Latitude and Longitude: If you know your precise latitude and longitude then you can enter that information in these fields, and don't have to scroll the map manually to mark your location. 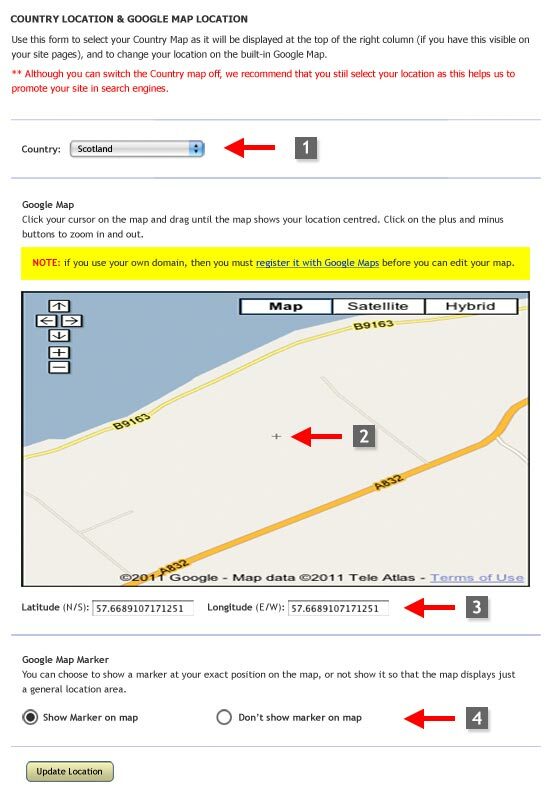 4) Map Marker: If you don't want the map to show your precise location, then select 'Don't show marker on map'. This will show your general location without being specific, and is handy if you have concerns about privacy. Once you're happy, click on the 'Update Location' button to record your changes, and the site map page will load showing the map in place and adjusted according to your changes. This is how your location map may then look on your site's Map page, with a small red flag marking your location precisely (unless you have chosen not to display the marker as described in section 4 above). If the map location isn't quite right, or you want to set a different zoom level as the default, then click on the 'Map Settings' button to adjust the Location Map settings again until your are happy.